Ferdie's Funhouse: 100 Years of Magic! 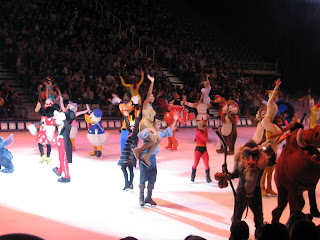 Last Saturday I did a most magical thing...I went to Disney On Ice! Hollie and Alyssa decided to surprise me and take me for my birthday (which isn't until December 8th, but Disney On Ice couldn't come back on the 8th just for me because of prior obligations) and it was AWESOME! To make things even better, we rode the FrontRunner there! In case you didn't know, I absolutely adore the FrontRunner, despite one time getting locked in it and having to go clear to Ogden and wait 20 minutes for the workers to smoke before they finally took us back to Clearfield. It makes me feel like Harry Potter on the Hogwarts Express! In fact, I have a plan to one day dress up like Harry Potter, complete with wand and cage holding a large, fake, snowy white owl, and just ride the FrontRunner back and forth, whispering little spells at people under my breath. But that's another post for the future! Anywho, so we get on the 4:23 train so that we can get to Salt Lake in plenty of time, and we're riding along, happy as can be, when I ask Hollie if I can see one of the tickets and she realizes she has left them at home! So we got off in Layton and just goofed around in the freezing cold of the station until kind Natalie brought us the tickets and we caught another train. We left Layton at 5:30 and got there just in time! They even went before it started and bought me some light up Mickey Ears to wear (which I kept on all night long of course)! 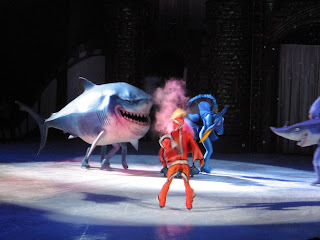 Now I had found out about the Disney On Ice surprise beforehand because Lyss is a horrible liar, but what I didn't know was that not only had they taken me on a most wondrous birthday adventure, but they had gotten seats on the 6TH ROW! I was so happy/grateful that as I sat down in my seat and the show started, I started to cry! The magic tends to just overwhelm me at times I suppose. After the incredible show that I could have watched for hours on end, they took me out to eat at Applebees, and then to Rocky Mountain Chocolate Factory for a mouth-watering chocolate drizzled caramel apple treat! It was a perfect night! Well, other than the fact that on the way home they forced me to eat a large majority of a partially white chocolate covered dog bone Hollie had bought for Ruby. It actually wasn't too bad if I bit the end with the chocolate to mix with the dry, grainy taste. Hollie was convinced she could put her heels together and bend all the way down without lifting them. She couldn't. But she was a lot closer than me or Lyss! Bruce was awful hungry.... Look how many characters were in the show! And this isn't even all of them. Oh ba ha ha ha ha! I am laughing so hard! I just loved that post! Can I ask you a favor? Will you post at least on post daily so that I can laugh! Your comments never leave me empty hearted! Quite the opposite! Seriously Ras? Why the frick haven't you posted?! It is so annoying! 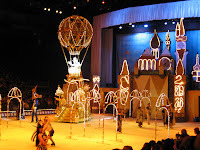 I have a very valid source that says you have had some sort of blog worth expereince since Disney on Ice! So get on it fool!